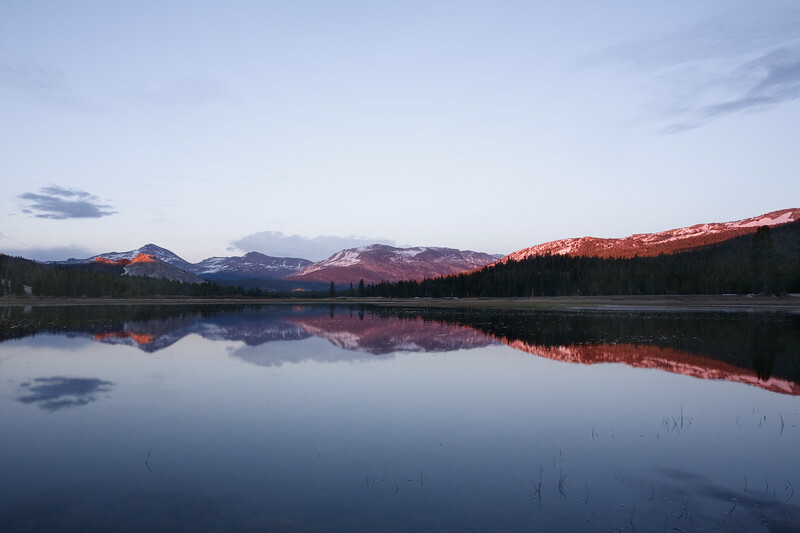 I "camped out" at Tuolumne Meadows to hopefully see the sunset. It was looking like the evening was going to be a bust. The clouds obscured the sun. Then it happened. I started seeing a glow from around Olmsted Point, too far for me to try and pick up my stuff and drive there, so I just stayed. All of a sudden I can see a red/orange tint on top of the rocks and trees! Had my longer lens, so I quickly changed to my wide-angle lens and captured Lembert Dome, Mount Dana, Mount Gibbs and Mammoth Peak in the background.